Seventh Day Baptist Missionary Society» Blog Archive » Gospel Feet 5K On for Conference 2017! 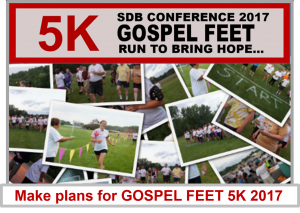 Gospel Feet 5K On for Conference 2017! The 5th annual Gospel Feet 5K is on for General Conference this year, to be held at the Azusa Pacific University, California. The goal this year is for us to partner with SDB Missions across the globe to bring hope to the lost, food to the hungry, water to the thirsty, aid to the sick, and homes for children who have no one. This race is only 5 kilometers, but with your contributions it will help us shine Light into places of darkness and bring aid to our neighbors in the far reaches of this planet. With your help, SDB ministers in more than 40 countries can be assisted to provide: water wells, aid for widows, families for orphans, disaster relief food, medicine and hope for prisoners, while sharing Jesus Christ, His love and all that He commanded. Look out for more details shortly. 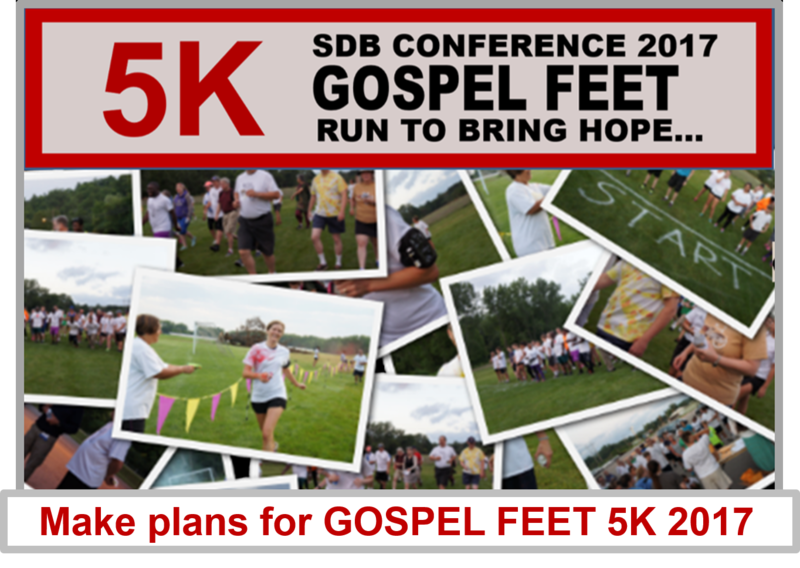 Make plans for (or sponsor a participant) GOSPEL FEET 5K Walk / Run at General Conference, Azusa, CA or just make a donation to help to bring hope and so much more around the world.